The RmarineHeatWaves package is a translation of the original Python code written by Eric C. J. Oliver that can be found on GitHub. This package is actively maintained, but on 2018-04-24 it was forked to a new package called heatwaveR, which will supercede and eventually replace RmarineHeatWaves in the near future. For continuity, we are ensuring that the functionality in heatwaveR will be exactly the same in RmarineHeatWaves, and for a while the two packages will be maintained in sync, at least as far as developments around the existing code-base are concerned. New functions will only be added to heatwaveR. The RmarineHeatWaves R package contains a number of functions which calculate and display marine heat waves according to the definition of Hobday et al. (2016). The marine cold spell option was implemented in version 0.13 (21 Nov 2015) of the Python module as a result of the preparation of Schlegel et al. (2017), wherein the cold events are introduced and briefly discussed. detect() The main function which detects the events as per the definition of Hobday et al. (2016). make_whole() Constructs a continuous, uninterrupted time series of temperatures. block_average() Calculates annual means for event metrics. event_line() Creates a line plot of marine heat waves or cold spells. lolli_plot() Creates a timeline of selected event metrics. exceedance() A function similar to detect() but that detects consecutive days above/below a given threshold. geom_flame() Creates flame polygons of marine heat waves or cold spells. geom_lolli() Creates a lolliplot timeline of selected event metric. The package also provides data of observed SST records for three historical MHWs: the 2011 Western Australia event, the 2012 Northwest Atlantic event and the 2003 Mediterranean event. The function will return a list of two tibbles (see the ‘tidyverse’), clim and event, which are the climatology and MHW (or MCS) events, respectively. The climatology contains the full time series of daily temperatures, as well as the the seasonal climatology, the threshold and various aspects of the events that were detected. The software was designed for detecting extreme thermal events, and the units specified below reflect that intended purpose. However, the various other kinds of extreme events may be detected according to the ‘marine heat wave’ specifications, and if that is the case, the appropriate units need to be determined by the user. doy Julian day (day-of-year). For non-leap years it runs 1…59 and 61…366, while leap years run 1…366. This column will be named differently if another name was specified to the doy argument. t The date of the temperature measurement. This column will be named differently if another name was specified to the x argument. temp If the software was used for the purpose for which it was designed, seawater temperature [deg. C] on the specified date will be returned. This column will of course be named differently if another kind of measurement was specified to the y argument. seas_clim_year Climatological seasonal cycle [deg. C]. thresh_clim_year Seasonally varying threshold (e.g., 90th percentile) [deg. C]. var_clim_year Seasonally varying variance (standard deviation) [deg. C]. thresh_criterion Boolean indicating if temp exceeds thresh_clim_year. duration_criterion Boolean indicating whether periods of consecutive thresh_criterion are >= min_duration. event Boolean indicating if all criteria that define a MHW or MCS are met. event_no A sequential number indicating the ID and order of occurence of the MHWs or MCSs. index_start Start index of event. index_stop Stop index of event. event_no A sequential number indicating the ID and order of the events. duration Duration of event [days]. date_start Start date of event [date]. date_stop Stop date of event [date]. date_peak Date of event peak [date]. int_mean Mean intensity [deg. C]. int_max Maximum (peak) intensity [deg. C]. int_var Intensity variability (standard deviation) [deg. C]. int_cum Cumulative intensity [deg. C x days]. rate_onset Onset rate of event [deg. C / day]. rate_decline Decline rate of event [deg. C / day]. int_max_rel_thresh, int_mean_rel_thresh, int_var_rel_thresh, and int_cum_rel_thresh are as above except relative to the threshold (e.g., 90th percentile) rather than the seasonal climatology. int_max_abs, int_mean_abs, int_var_abs, and int_cum_abs are as above except as absolute magnitudes rather than relative to the seasonal climatology or threshold. Note that rate_onset and rate_decline will return NA when the event begins/ends on the first/last day of the time series. This may be particularly evident when the function is applied to large gridded data sets. Although the other metrics do not contain any errors and provide sensible values, please take this into account in its interpretation. #> 1       22      95. 1999-05-13 1999-05-22     2.50    3.60   237. #> 2       42      60. 2011-02-06 2011-02-28     3.21    6.51   193. #> 3       49      47. 2012-01-11 2012-01-27     2.23    3.30   105. # Note that this is accomplished by setting 'colour.n = NA', not by setting 'n = 0'. #> 1       16      76. 1990-04-13 1990-05-11    -2.54   -3.22  -193. #> 2       54      58. 2003-12-19 2004-01-23    -1.80   -2.66  -104. In addition to the calculation of extreme events, consecutive days over a given static threshold may be calculated with the exceedance() function. The same function may be used to calculate consecutive days below a threshold, too. We can also load the gridded 0.25 degree Reynolds OISST data and apply the function pixel by pixel over all of the days of data. The example data used here have 93 longitude steps, 43 latitude steps, and cover 12797 days (1981 to 2016). We apply the detect() function to these data, fit a generalised linear model (GLM), and then plot the trend per decade of the marine heatwave count. In other words, have marine heatwaves become more or less frequent in recent years? Under climate change we can expect that extreme events would tend to occur more frequently and be of greater intensity. 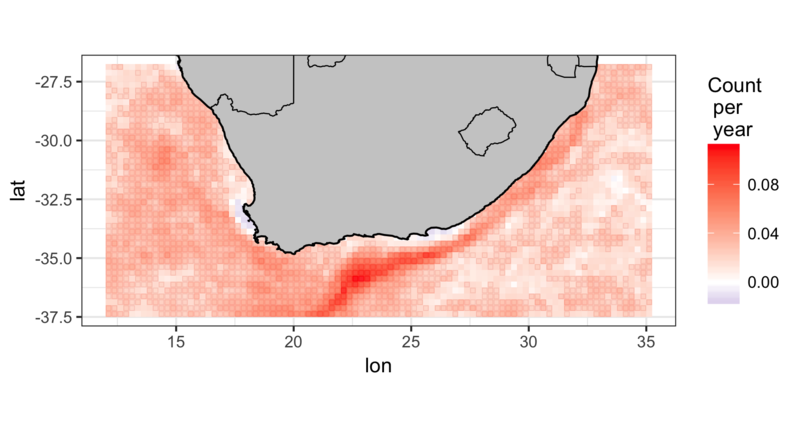 Indeed, we can clearly see in the figure below of the result of the GLM, how the Agulhas Current has been experiencing marine heat waves more frequently in recent decades. 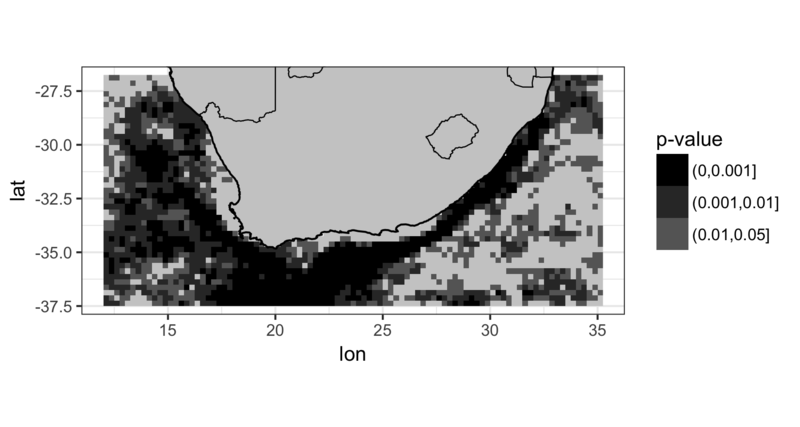 But there are two smaller areas, one along the western side of the Cape Peninsula in the Benguela Upwelling system and another around the Eastern Cape Province near Algoa Bay, where the frequency of marine heat waves seems to have actually been decreasing – although the P-value of the decreasing trend is > 0.05, and therefore not significant. Please read the package vignette to see how to load a netCDF file with the OISST data, apply the RmarineHeatWaves function to the whole 3D array of data, and then fit the GLM and plot the data. Hobday, A.J. et al. (2016). A hierarchical approach to defining marine heatwaves, Progress in Oceanography, 141, pp. 227-238. Schlegel, R. W., Oliver, E. C. J., Wernberg, T. W., Smit, A. J. (2017). Coastal and offshore co-occurrences of marine heatwaves and cold-spells. Progress in Oceanography, 151, pp. 189-205. Schlegel, R. W., Oliver, E. C., Perkins-Kirkpatrick, S., Kruger, A., Smit, A. J. (2017). Predominant atmospheric and oceanic patterns during coastal marine heatwaves. Frontiers in Marine Science, 4, 323. The Python code was written by Eric C. J. Oliver. Contributors to the Marine Heatwaves definition and its numerical implementation include Alistair J. Hobday, Lisa V. Alexander, Sarah E. Perkins, Dan A. Smale, Sandra C. Straub, Jessica Benthuysen, Michael T. Burrows, Markus G. Donat, Ming Feng, Neil J. Holbrook, Pippa J. Moore, Hillary A. Scannell, Alex Sen Gupta, and Thomas Wernberg. The translation from Python to R was done by A. J. Smit and the graphing functions were contributed to by Robert. W. Schlegel.